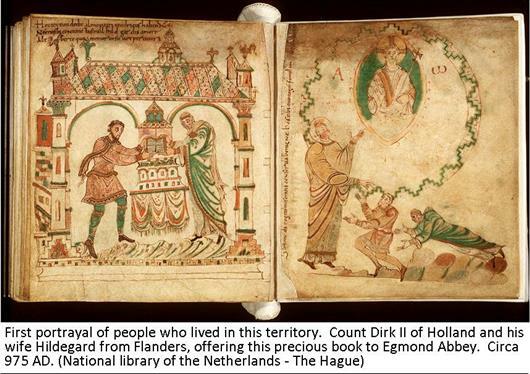 EARLY MIDDLE AGES TO 1000 AD The early Middle Ages, and the heartland of what one day was going to be Holland remained largely an empty peat wilderness. The fall of the Roman Empire had brought chaos. Trade and population had collapsed, also in the former non-Roman territories - those people had lost a market. The situation was slightly better on the higher dry grounds east, around Utrecht and beyond. Where agriculture made a denser population possible, but production just allowing limited barter trade and small scale home industry. Late 7th century international trade started up slowly thanks to the developing of the Carolingian Empire bringing more stability. 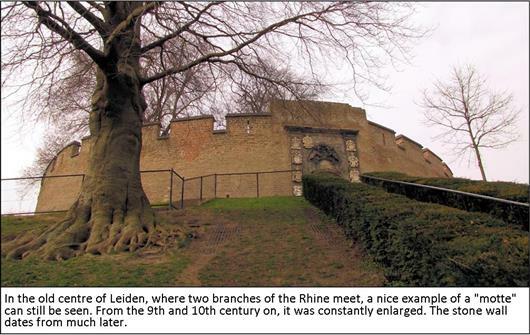 Just south of Utrecht, at the confluence of two branches of the river Rhine, the town of Dorestad became a key place in the shipping routes between Germany and the north of France, England, and Scandinavia. With the River Vecht the main north - south route through these parts. 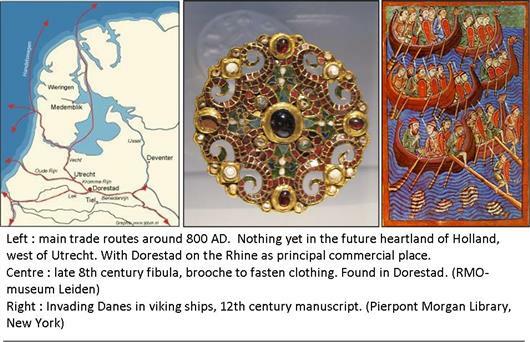 During the 9th century the Vikings gratefully used this excellent fluvial network for their marauding expeditions. The few existing towns and villages were systematically plundered and devastated. First prize Dorestad even time and again. The place was finally abandoned, and disappeared totally from the face of the earth. Another backlash for fragile prosperity in this part of Europe. Because of the Viking attacks, artificial hills with a circular palisade on it were erected. Where people and cattle could take refuge. In the low parts, with frequent flooding, such a "motte" proved most useful as high ground shelter as well. Towards the end of the millennium, the name Holland was first used to indicate those rare slightly elevated pieces of ground along the coastal dunes and rivers. On it a few small villages, with a population of may be a couple of hundred people.